Paris, Gabriel Huquier, . 2 parts in 1 volume. Royal 4to (32 x 24 cm). 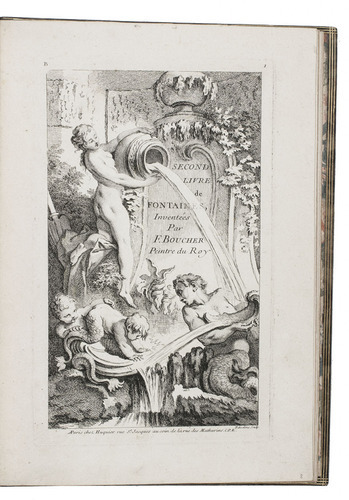 With 2 series of 7 finely etched and engraved plates of water fountains, including 2 title-prints, the first series with only the names of the artist François Boucher and publisher Gabriel Huquier, the second also with the name of its engraver Pierre(-Alexandre?) Aveline. 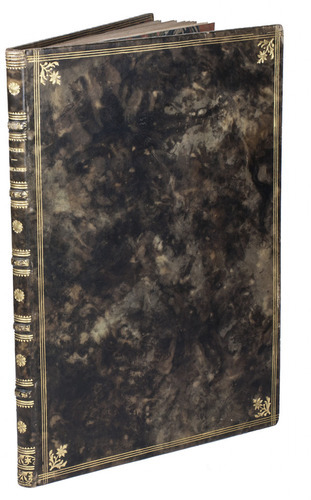 19th-century gold-tooled dark mottled sheepskin, gilt edges. 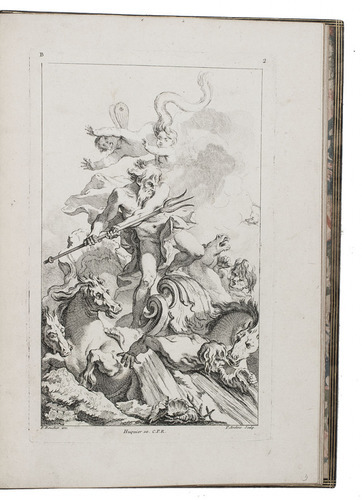 Two rare print series (part 2 especially rare) showing beautiful, rich and decorative designs for fountains by François Boucher (1703-1770), famous French painter and decorative draughtsman, professor and later director of the Paris Academy, inspector of the Gobelin manufacture at Paris, and "premier peintre du Roi". The present two series show some of his best work, richly decorative forms in an early rococo style, incorporating (mostly wingless) putti, naked water nymphs (naiads), merfolk, a satyr, Neptune in his seahorse-drawn chariot, other water gods and godesses, shells, dolphins, sea monsters, a swan and other animals. Some were actually built: the Neptune print may have inspired Barthélemy Guibal's 1750 Fontaine de Neptune at the Place Royale in Nancy. 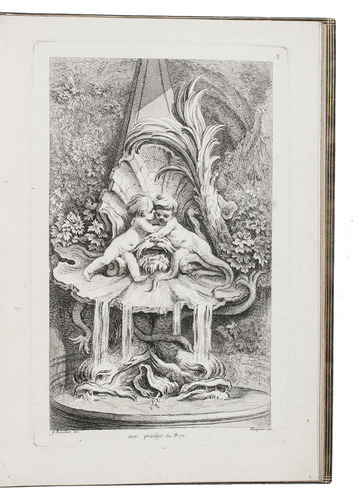 Extra inserted: 18th century engraved copy of plate 6 of the first series, showing a rich design with two Tritons blowing shell trumpets, unsigned. From the Library of Jean Fürstenberg (1890-1982), co-founder of the Association Internationale de Bibliophilie, with his book-label. 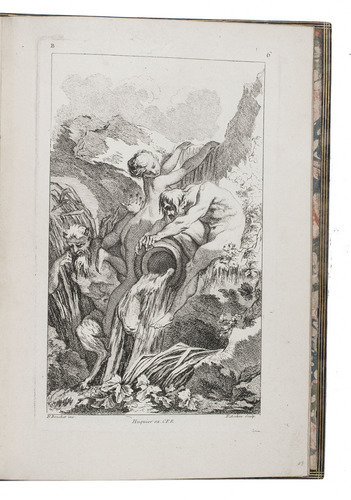 The last print is slightly worn at a former fold and about half show small marginal holes or marginal restorations, none approaching the plate edge and otherwise in very good condition and with large margins. Berlin Kat. 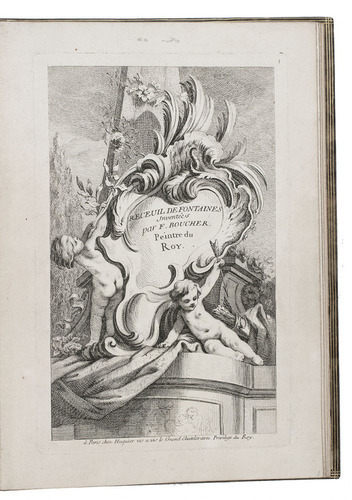 3581; J. Fürstenberg, La gravure originale dans l'ill. du livres Franç. = Die Original-Graphik in der französ. Buchillustr., 1975, no. 63 (this copy); KVK & WorldCat (5 copies part 1 ,1(?) copy of part 2); P. Jean-Richard, L'oeuvre gravé de F. Boucher, 1978, 1090-1097 & 216-222.